Tanzania Photo Safari. This is Africa as you’ve always imagined it to be: the magic of a Serengeti sunset, the teeming wildlife of Ngorongoro Crater. A safari to Tanzania is a special adventure into the premier game-viewing country of Africa. Tanzania’s great game parks and reserves are unsurpassed anywhere in the world. We’ll see all of the major plains animals, zebras, giraffes, impalas, gazelles, and other herbivores. There will be baboons and monkeys, herds of elephant and buffalo, and some of the most wonderful bird life you will ever see. Not a serious photographer? Not a problem. You will enjoy the extra time we spend viewing and observing the wildlife and fabulous landscapes. Experience! Boyd has 30 years of traveling here and leading photo tours (and five published books on African subjects). This is total immersion in the photography and natural history of one of the last great wildlife places on earth. Moreover, you will be helping to save Serengeti! Boyd has been leading the battle to stop a destructive commercial highway (and possible railroad) that would cut across northern Serengeti National Park, bisecting the greatest land mammal migration on earth. He is the co-founder and co-director of Serengeti Watch, a non-profit 501 (c) 3 organization to protect and preserve the Serengeti ecosystem. 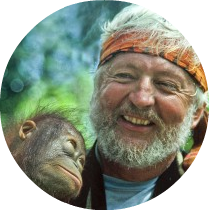 He is also the founder of the STOP THE SERENGETI HIGHWAY Facebook page which has nearly 60,000 followers worldwide. Photographic expertise and leadership of Boyd Norton. Boyd has made more than 50 trips to Africa. He estimates that he has spent almost 1000 days in the Serengeti ecosystem. Five of Boyd’s sixteen acclaimed books are on African subjects. His newest, Serengeti: The Eternal Beginning, was published in 2011. He’ll show you his secret places for best landscapes and wildlife. Barbara Norton is an award winning video producer who has made more than 30 trips to Africa. 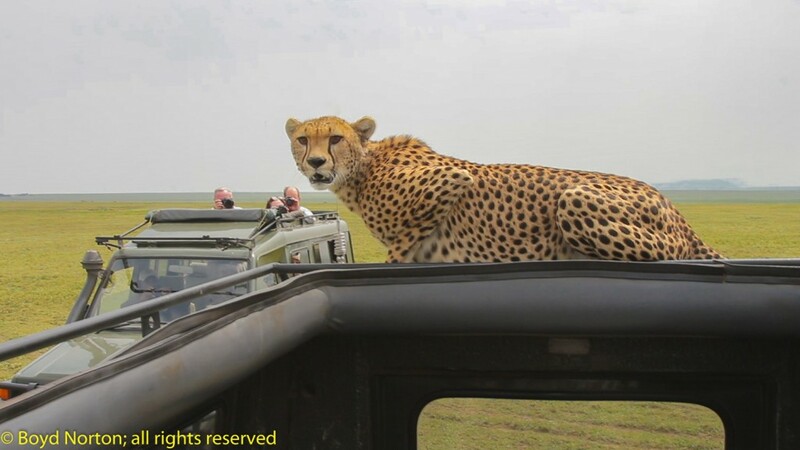 * Intensive game viewing and photography at Serengeti National Park during migration time. * Time to absorb and photograph the wonder of it all. Most safari companies rush from place to place. We take our time. We can spend hours watching and waiting for the action or just the right light. * Of SPECIAL IMPORTANCE to photographers, each tent is equipped with electrical outlets. This allows you to re-charge batteries, back up your files, review and edit photographs – all in the privacy of your own tent. * Exploration of Ngorongoro Crater and a chance to photograph a Maasai boma. * Visit to Olduvai Gorge and the Zinjanthropus Site. Accommodations will be a combination of modern, deluxe lodges and permanent tent camps. The lodges are in harmony with their environment and are constructed of local materials. Camping consists of spacious canvas tents that are set up exclusively for your private booking and located as close to the herds as possible. Each tent is equipped with tables and comfortable beds with mattresses, sheets, pillows, and blankets. There is a verandah attached to each tent with two camp chairs and a canvas washbasin that is filled with hot water in the morning, afternoon, and in the evening. Tents are ensuite, with a flush toilets, and showers. As a compromise between providing ample space and reducing our carbon footprint, we will have 4 people per 7 passenger “stretch” Land Cruisers. Since we started this practice several years ago we have had overwhelming approval from our participants. Food at all locations is well prepared and delicious. There will be picnic lunches some days while on safari to maximize time photographing wildlife. participants traveling together, maximum of 12. There will be a small group surcharge of $500 with 6-9 paying participants. Includes all safari meals, lodging, transfers, vehicles and driver guides, photography instruction. Does not include international airfare, tips, alcoholic beverages. 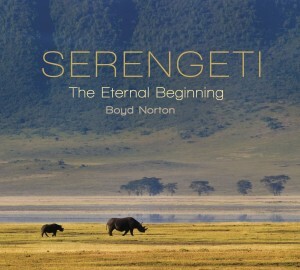 Boyd’s newest book, Serengeti: The Eternal Beginning, was published in October 2011. A significant portion of the book’s proceeds are donated to Serengeti Watch. The next day we will spend the entire day exploring the crater, leaving early in the morning, well before most tour vehicles depart. We will descend from the rim, at about 7,600 feet in elevation, to the floor of the crater some 2,000 feet below for the first game drive. This 102-square-mile crater is the world’s largest, unflooded, unbroken caldera. Within its perimeter are thousands of wildebeest, black rhino, cheetah, gazelle, giraffe, and a high density of lions, hyenas, and other predators. (Recommended reading: The Innocent Killers by Jane and Hugo Van Lawick-Goodall). Flamingos inhabit an alkaline lake in the center of the crater, and other bird life is abundant. * Special feature: depending upon his availability, Boyd’s Maasai friend, Edward Sindato Ngobei, may accompany us one of the days in the crater. Edward is a university graduate, a young chief of the local Maasai and works for the Ngorongoro Conservation Area. Edward has been featured in two U.S. nationally broadcast television programs (in one he was Anthony Hopkins’ guide). Edward is pleased to answer any questions about the Maasai culture, one of the few remaining unchanged cultures in Africa. 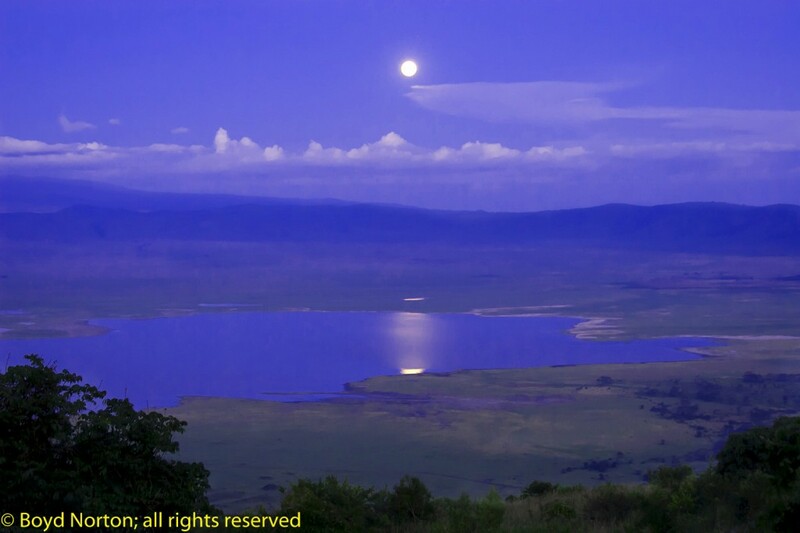 From Ngorongoro we’ll drive to the Serengeti, via Olduvai Gorge, the world-renowned site of discoveries of early hominids made by archaeologists Mary and Louis Leakey. The Serengeti is one of the most famous wildlife areas in the world. The park’s 5,700 square miles are part of the 9,600-square-mile Mara-Serengeti ecosystem, home to incredible herds of wildebeest and other grazing animals. This vast area consists of treeless central plains, savannah dotted with acacias and granite outcroppings called kopjes, and riparian bush and forest in the north. We have timed the trip to coincide with the great Serengeti migration. (Photo Left) Although there are never guarantees in the natural world, we usually see huge herds of wildebeest and other plains animals grazing on the savannah. The herds follow the rains and feed on the new grass, so what we will actually see depends upon the weather pattern. If past years are any indication, we have positioned ourselves to be in the right location at the right time. We will spend the next three evenings at Semetu Tented Camp. Situated at the heart of the Serengeti National Park, the camp resides at the eastern edge of the infamous Seronera Valley, which is often referred to at the ‘predator capital of Africa’. The immediate area offers arguably the best year round wildlife viewing in the entire park due to dense resident populations of large game including: lion, leopard, cheetah, elephant, giraffe, hippo, buffalo and several species of antelope. 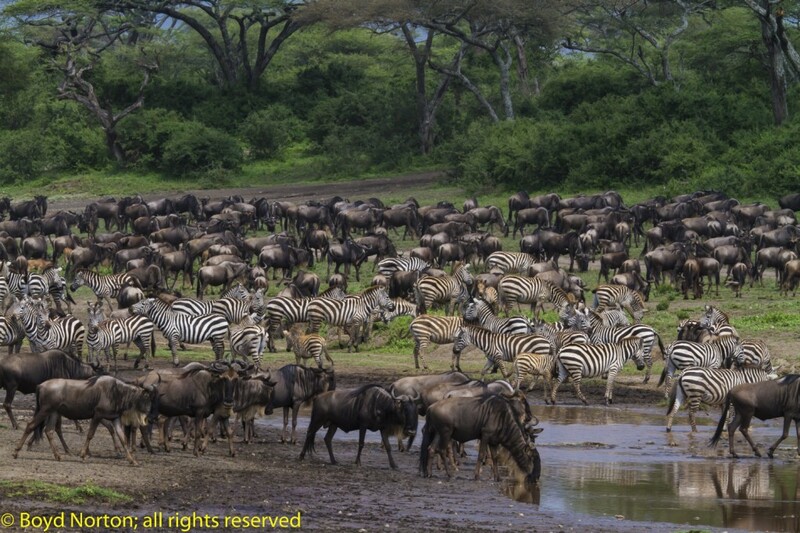 When the great wildebeest and zebra migration thunders through twice a year, game viewing is unbeatable. This deliberately rustic eco-lodge is managed in tune with the surrounding pristine wilderness, with a maximum occupancy of 12 – 14 guests, the camp’s authentic seclusion is unmatched. Moreover, it is located in a region that has little tourism traffic and some outstanding game photography opportunities. Semetu has a team of dedicated attendants, cooks and staff, assuring you one of the most intimate experiences available in the Serengeti. Three overnights SEMETU TENTED CAMP. 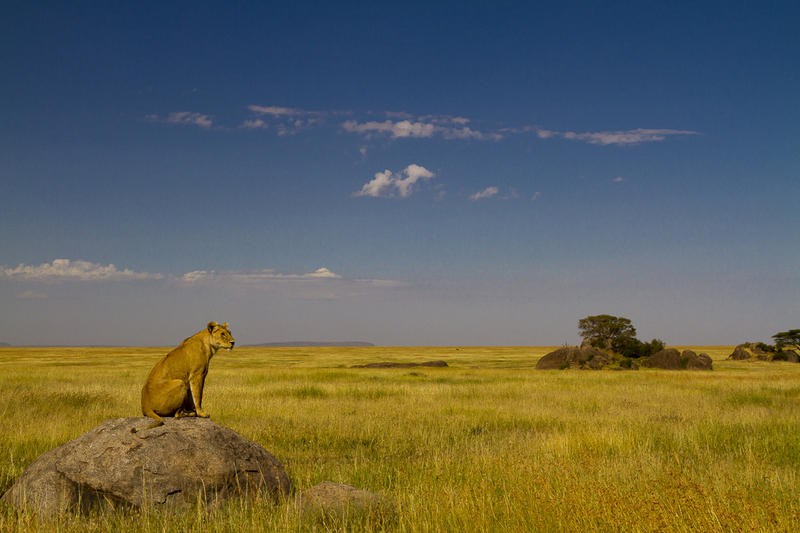 Lioness looking for possible breakfast, Semetu Kopjes, Serengeti National Park, Tanzania. 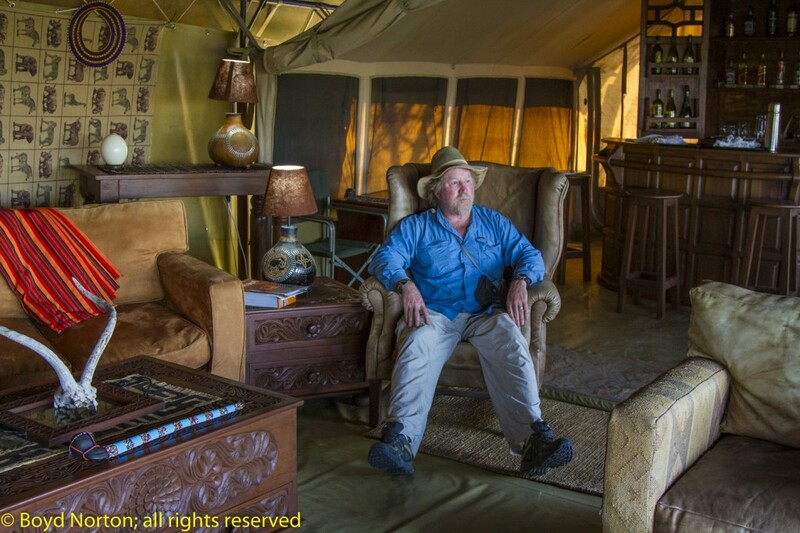 The next three evenings we will stay in a permanent tented camp located in the Lake Ndutu area. The camp will be set up in advance for the private use of the tour group. It is nestled in an acacia woodland which is often filled with herds of wildebeest and zebra at this time of year. Three nights at Woodlands Tented Camp. We will say farewell to the Serengeti plains and drive back past Ngoronogoro to the Plantation Lodge. The accommodations for the evening are on an old coffee farm with its beautiful gardens and exceptional rooms. You will immediately notice the care and attention that went into creating this lodge. While here we will have opportunity to meet our good friends, Dr. Frank Artress and his wife Susan, founders of a medical clinic in Karatu. This amazing couple gave up a thriving medical practice in San Francisco to devote their lives to helping people in the region with their medical needs. See a short video about them here. Overnight PLANTATION LODGE.